UPDATED: Fri., June 16, 2017, 5:55 p.m.
Before he became a streetball hero and an all-star on three continents, Adris DeLeon was an Eastern Washington Eagle. That still means a lot – enough to bring DeLeon 4,000 miles back to Cheney to walk in Saturday’s graduation ceremonies. It’s his first trip back to Cheney – a bit of unfinished business even though he earned his degree in physical education in 2009. “It’s important for me come back, for my mother and my brother,” said DeLeon, who still plays professionally in the Caribbean. “I’m still a role model for my brother, and I want to be able to show that you can do anything if you put your mind to it,” DeLeon said. DeLeon has done that and more in his 32 years of overachievement. Born in the Dominican Republic but raised in New York City, he didn’t take basketball seriously until his senior year in high school. 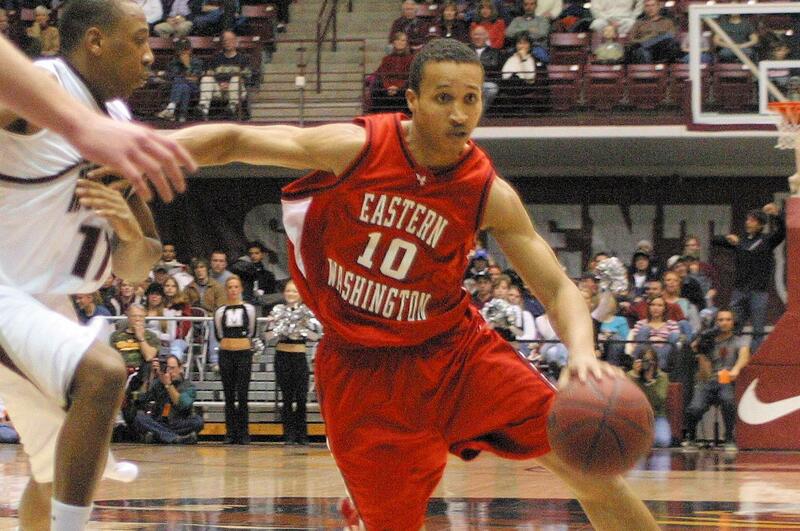 However, DeLeon raised his game to a level that earned him scholarships at the College of the Siskiyous, the College of Southern Idaho and finally at EWU in 2007. A lightning-quick guard, he played 48 games for the Eagles while averaging 9.5 points and 2.2 assists. He’s best remembered for an epic performance at Reese Court on Jan. 17, 2008, when he scored 42 points in an overtime win over Northern Colorado. Not surprisingly, the 5-foot-11, 165-pound DeLeon went undrafted by the NBA in 2009, so he signed with a team in Nova Scotia. Later he played for three teams in his homeland before playing pro ball in Spain in 2010-11. DeLeon’s defining moment didn’t come on the hardwood, but on the hard concrete of New York in the summer of 2011. Visiting his family during the NBA lockout, he showcased his agility and ball skills and held his own against Brandon Jennings and other NBA veterans. More tangible was the attention of pro scouts from around the world. DeLeon settled on another far-flung adventure, this time with the Gold Coast Blaze of Australia. DeLeon played for another Australian team in 2013 before returning for good to the Caribbean. In April 2014, he signed with Pirates de Quebradillas of Puerto Rico. He later joined Metros de Santiago and helped them win the 2014 championship; now he’s with teams in both Puerto Rican and the Dominican Republic. DeLeon turns 33 on July 10, but still has plenty of game – perhaps because his pro teams didn’t allow him on the concrete. Last fall, he scored 54 points in a Dominican league game. “But I still miss those days in New York,” said DeLeon, who plans to coach when his playing days are over. He also misses his old friends in Cheney, including teammates Benny Valentine, Brandon Moore, Gary Gibson, Kellen Williams, Trey Gross and former coach Kirk Earlywine. “We still stay in touch,” DeLeon said. Published: June 16, 2017, 5:48 p.m. Updated: June 16, 2017, 5:55 p.m.